Goblins… the ultimate, low-level cannon fodder for starting a new fantasy roleplaying campaign. I have often wondered, what would happen if these seemingly “speed bump” creatures actually were played as a formidable and dynamic force in a fantasy roleplaying campaign. What if they weren’t just little green lemmings marching to their doom at the hands of an adventuring party? In this three part series, I will explore different options for breathing life into goblin civilization for your campaign. In part one of this series, we’ll talk about Names, Language, Physical Qualities and how these topics can help breathe life into your goblins and make them more memorable to your campaign. Just giving something a name in your campaign automatically gives it more significance in the eyes of the players. The Goblin Name Generator at Seventh Sanctum is a great utility for designing goblin names. One negative is that is doesn’t differentiate what one may consider a male names versus a female name. A second is that sometimes the name combinations can be somewhat goofy. Overall though, it is a great tool, especially for those that find difficulty in naming things. You can take these ideas and form them into something that works for your campaign. Maybe Sorn is the leader of the Tonguecut clan, a brutal clan known for cutting out the tongues of their victims. Or maybe the Tonguecut warriors cut their own tongues, leading to a very unique type of speech (even amongst goblins). When it comes to building a goblin language, you have to think of what will be useful and productive for your game. Building an entire foreign language with letters, spelling, grammar, sentence structures, and vocabulary, would be awesome and immersive, but would also be incredibly time consuming. How much value would you get for the amount of time you would put into a project that big? I would focus on smaller bits and pieces that are less time consuming and likely to come into play. – Are there multiple goblin dialects, or just one goblin language? – Do they have a written version of their language? – Do any other races or cultures commonly use their language? – What words don’t translate well into their language (For example, do goblins even understand the words: greed, steal, betray, compassion, love, cry, justice, please, mercy)? Designing a few phrases that the players can recognize will add depth to a campaign. 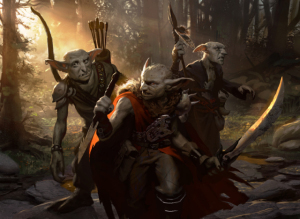 Maybe goblins always start their battles with the war cry, “Muukuur daan Rhuul Sher!” (Honor the Blood Chief). The worst insult in their language may be, “Or daar agaan droch.” (Your teeth are dull), especially to goblins from the Razorfang tribe. Creating several of these saying and dropping them into your campaign will be an efficient way of adding a unique language into your campaign without developing the entire language itself. There are several “Common to Goblin” language generators and translators available on the internet. Screwy Truths has a very clean and simple Common to Goblin Translator that creates words that sound like the language of Eberron’s goblins. Typical fantasy goblins will range from three to three and a half feet tall. Their bodies are lean and scrawny with a wide, ungainly head. An over-sized goblin may grow to four or five feet tall. These over-sized creatures will typically appear obese and weigh anywhere between 225 to 275 pounds. Many goblins have some sort of enhanced vision that allows them to see in the dark, such as nightvision or darkvision. – What kind of jewelry and adornments do goblins wear? – What are the meanings of goblin tattoos? – What are the meanings of goblin ritual scarring? – What are common weapon types they are known to use (daggers, swords, spears, maces, sickles, short bows, long bows, crossbows, slings)? – What are common armor types they are known to use (no armor, hide armor, leather armor, chain mail, heavy armor, bits of stolen armor)? – What tools would you find in an area that goblins have been in? Picture two goblins standing side by side. The first, Tugarn, stands nearly four and a half feet tall and weighs in at over two hundred pounds. He has numerous tattoos and scars all over his body. Some of the scars appear to be some form of ritualistic scarring, while the others are clearly battle scars. He’s carrying a shortsword, a buckler, and is wearing pieced together bits of heavy armor fastened all over his body. The helmet he wears doesn’t fit very well and appears to be of dwarven construction. The second, Nurs, stands approximately three feet tall with a very lean and muscled body. Most of the hair on his body appears to have been shaved off or singed away. Numerous intricate piercings and chains adorn his body. He carries a blacksmith hammer in one hand and a dagger in the other. The chainmail armor he wears appears to fit his frame perfectly. Perhaps Tugarn is a warrior goblin and Nurs is a blacksmith? How would what they wear and what they do as a profession affect how they interact or fight with the players? Remember, goblins can be much more than an unmemorable encounter that garners experience and helps you get a quick combat in early on in your campaign. Thanks for reading and don’t forget to check out the other parts to this series! Awesome article I’ve always loved featuring a creature “type” as a focal theme for a campaign and it really helps being able to present a race with a great deal of variation. One of my favorite campaigns of all time was the 4E campaign where the primary antagonists of the first Tier (Level 1-10) were hobgoblins trying to retake ancestral homelands. They carried the full tier, it was awesome!